No matter how hard we try, we cannot stop all technology issues from occurring. We have all had our share of technology disasters. Through the years, I have had my own share. I have managed to lock myself out of countless computers, and I have even managed to delete some important files, this last one we have probably all experienced from time to time. One of the things that I do is take care of my devices. I cannot say that I am perfect with my gadgets I have had my share of issues. I have managed to ding a couple of devices, most notably my original iPad, a cracked iPhone screen, and a scratch on a Series 0 Apple Watch. There is one product where I have had worse luck than others: the iPod nano. Besides experiencing the scratched front of the first iPod nano, I have managed to One of the other things that I have managed to do is lose an iPod. This was also an iPod Nano. Maybe I just have bad luck with iPod Nano. I have yet another story to add to the already existing list. So last Wednesday, just after 9 a.m. I went and used the restroom. After I was done and the toilet was flushing, I leaned over and I managed to lean over just a bit too far, and my AirPods fell out of my shirt pocket and straight into the toilet. Yes, you read that correctly. And before you think anything, the water was clean. At first, as with most other times when something similar happens, you go “Wait, really?”, and I quickly tried to grab them out of the toilet. Unfortunately, I was unsuccessful. If I would have been at home, I might have had a chance, but since I was at work, there was no hope due to the increased water flow. After realizing that what I hoped did not happen, actually did happen, I washed my hands, and went back to my desk. If a single AirPod had dropped down a sewer or elsewhere I could have contacted AppleCare and paid for a replacement, or if I was able to reach it, I could have used a magnetic screwdriver or other magnetic tool to grab the AirPod, sadly that was not the case. I already knew that getting a new pair of AirPods would not be very likely given that Apple’s own shipping stated a 6 week order time. I had resigned myself to not being able to get a new pair anytime soon. I went looking on all sorts of websites to see if I could find any in stock, or relatively in-stock soon. This included the usuals: Amazon and Best Buy. Then I thought about it for a minute and realized that there was a site, Is In Stock and I looked there. As suspected, they said “Notify When Available”. I took a chance and looked at each of the sites listed. All of the sites either said “Not Available”, or “add to cart” with delivery at a future date. I took a chance and ordered from one of the sites. An hour or so after I ordered, I contacted their chat help to see if they had any in stock. Lo and Behold, they did infect have “an stock”. I take it that either the chat representative mistyped or English is not their first language. At this point, I was pretty confident that I would be getting my replacement AirPods this week. 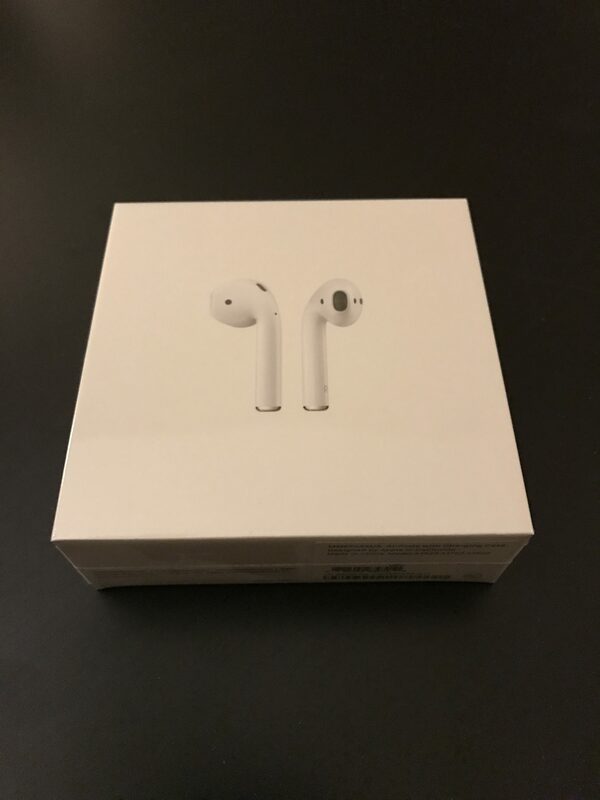 Luckily, they actually arrived on Saturday, so I now have another pair of AirPods. Even though I only spent a few days without them, I do have a few observations about having to return to using the wired EarPods. During my few days having to return to using wired headphones. First off, wires are evil. They get tangled too easily in things, they are a hassle, and without an adapter, you can’t charge and listen at the same time. Of course, the EarPods do have some benefits, most notably that you can continue listen if you take an EarPod out, however, I have become accustom to it stopping when I remove an AirPod, so this behavior was a bit different to have to return to. Having my Beats Solo 3 as a backup came in very handy. While the AirPods are very convenient, the bigger battery of the Beats Solo 3 Wireless allows them to to last for a quite a while. If I had not had them, I would have likely run home during my lunch and retrieved a pair of wired EarPods. Once you become accustom to the AirPods, it is difficult to go back to using wired headphones. I fully realize that me losing my AirPods is 1) entirely my own fault, 2) a “First World Problem”. I will not deny either of them in the slightest. Strangely, I had the AirPods for exactly 120 days, this came out to about $1.33 per day. Was it worth the price, yes. However, I do wish the cost per day would have been amortized over the course of a couple of years, not 120 days. I am glad that I was able to get another pair so quickly, otherwise it would have been tough to deal without them. Even in the short time that I have had them, I have come to rely on them. One thing that I will no longer be doing is putting AirPods in my shirt pocket. Instead, they will go in my side pocket or I will leave them somewhere else. If you are interested in the AirPods, now is the time to order them since it may take up to six weeks to arrive.